Launched in 2011, the Lower Great Lakes Young Forest Initiative is in Bird Conservation Region 13, the Lower Great Lakes/St. Lawrence Plain. This conservation initiative takes in low-lying terrain near Lakes Huron, Erie, and Ontario, and several major river valleys. The region includes parts of Ohio, Pennsylvania, New York, Vermont, and the Canadian provinces of Ontario and Quebec. 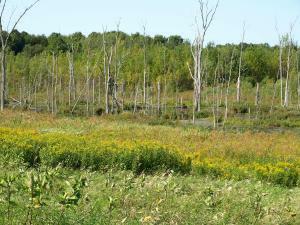 The terrain is relatively flat, with damp soils and abundant wetlands. In recent decades agriculture has dominated the landscape, and urbanization has wiped out many acres of former wildlife habitat. Less-developed areas and less-intensively managed farmlands still support young-forest tracts. Creating and rejuvenating young-forest habitat on both public and private lands will benefit woodcock, ruffed grouse, golden-winged and blue-winged warblers, brown thrashers, willow flycatchers, bobcats, wood and bog turtles, and numerous other wild creatures, including many whose populations have fallen in recent years. Many birds that breed in mature forests also use densely vegetated young-forest habitats for feeding and rearing their young. Partners in the Lower Great Lakes are developing Demonstration Areas to display up-to-date management techniques for fostering the young-forest, old-field, and scrub-shrub habitats that are important to a broad spectrum of birds, mammals, reptiles, and amphibians. An important partner is the Golden-Winged Warbler Working Group. The population of golden-winged warblers is also declining in the region, at least in part from habitat loss. Biologists will develop a set of Best Management Practices to benefit woodcock, golden-winged warblers, and other young-forest wildlife in the region surrounding the Lower Great Lakes.